China is looking seriously at a range of nuclear options. From the commercial side of things, the country is building over 25 light water reactors, including four of the new US-designed AP1000. The Chinese are also pursuing a range of advanced reactor programmes, including gas-cooled pebble-bed modular reactors (the 210 MWe HTR-PM), a thorium-focused research initiative based on the molten-salt reactor, and an ambitious fast spectrum reactor research, demonstration and deployment (RD&D) plan. It is the latter that I wish to discuss here. Some of you would already know that the Chinese are in the late stages of planning the construction of two Russian-designed BN-800 sodium-cooled fast reactors, to be located at a site on China’s east coast. These are scaled-up (880 MWe) versions of the BN-600, which has run successfully in Russia for a number of decades. There is also the Chinese Experimental Fast Reactor (CEFR), a 25 MWe demonstration unit near Beijing. In China, R&D on fast neutron reactors started in 1964. 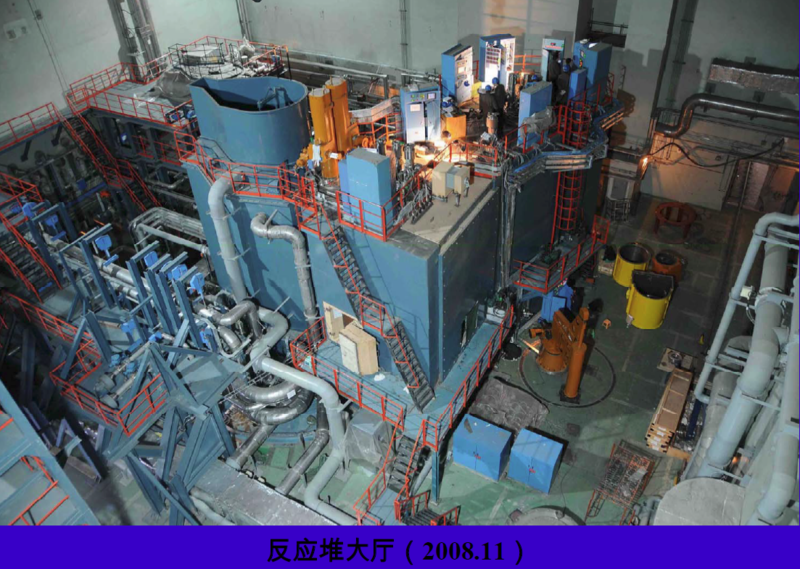 A 65 MWt fast neutron reactor – the Chinese Experimental Fast Reactor (CEFR) – was designed by 2003 and built near Beijing by Russia’s OKBM Afrikantov in collaboration with OKB Gidropress, NIKIET and Kurchatov Institute. It achieved first criticality in July 2010, can generate 20 MWe and was grid connected in July 2011 at 40% of power, to ramp up to 20 MWe by December. Core height is 45 cm, and it has 150 kg Pu (98 kg Pu-239). Temperature reactivity and power reactivity are both negative. A 1000 MWe Chinese prototype fast reactor (CDFR) based on CEFR is envisaged with construction start in 2017 and commissioning as the next step in CIAE’s program. This will be a 3-loop 2500 MWt pool-type, use MOX fuel with average 66 GWd/t burn-up, run at 544°C, have breeding ratio 1.2, with 316 core fuel assemblies and 255 blanket ones, and a 40-year life. This is CIAE’s “project one” CDFR. It will have active and passive shutdown systems and passive decay heat removal. This may be developed into a CCFR of about the same size by 2030, using MOX + actinide or metal + actinide fuel. 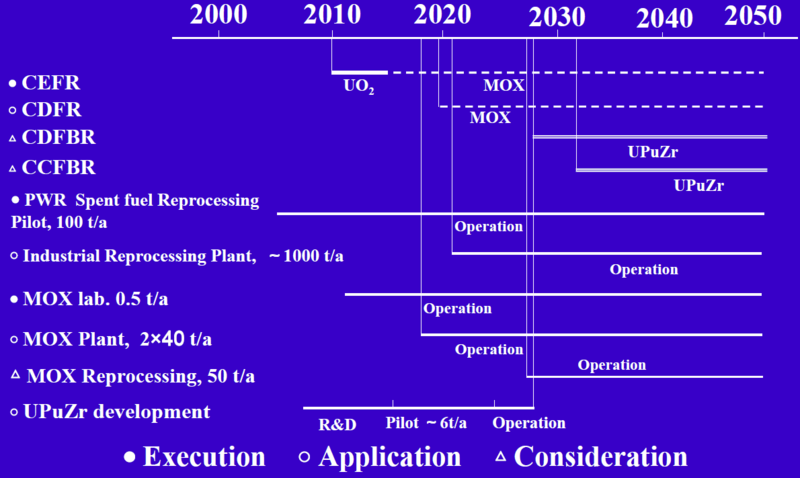 MOX is seen only as an interim fuel, the target arrangement is metal fuel in closed cycle. 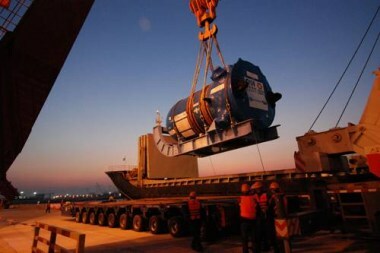 However, in October 2009 an agreement was signed with Russia’s Atomstroyexport to start pre-project and design works for a commercial nuclear power plant with two BN-800 reactors in China, referred to by CIAE as ‘project 2’ Chinese Demonstration Fast Reactors (CDFR) – in China, with construction to start in 2013 and commissioning 2018-19. These would be similar to the OKBM Afrikantov design being built at Beloyarsk 4 and due to start up in 2012. In contrast to the intention in Russia, these will use ceramic MOX fuel pellets. The project is expected to lead to bilateral cooperation of fuel cycles for fast reactors. The CIAE’s CDFR 1000 is to be followed by a 1200 MWe CDFBR by about 2028, conforming to Gen IV criteria. This will have U-Pu-Zr fuel with 120 GWd/t burn-up and breeding ratio of 1.5, or less with minor actinide and long-lived fission product recycle. 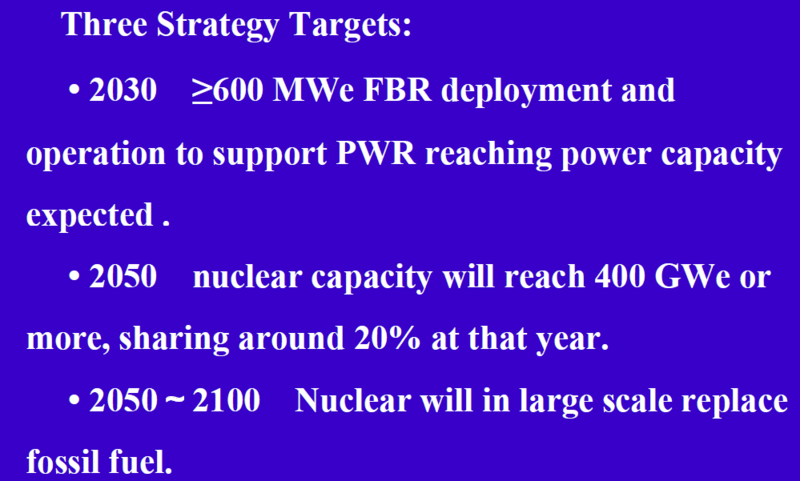 CIAE projections show fast reactors progressively increasing from 2020 to at least 200 GWe by 2050, and 1400 GWe by 2100. For those with an engineering bent, further technical papers on this programme are available here, a timeline of the CEFR is here, and a short tabular summary here. Although both the BN-800 and CEFR are oxide-fueled designs, sources tell me that the Chinese are interested in metal fuel (a U-Pu-Zr ternary alloy) and pyroprocessing by the time they reach commercial fast reactors. CEFR actually uses uranium oxide (fabricated in Russia) since they do not have the MOX (mixed Pu-U oxide fuel) capability. My sources tell me that they cannot use metal fuel yet since they do not have the technology, nor fabrication facility. However, they are planning to develop the metal fuel capability and hopefully apply to CDFR. The plan is to start with MOX and then gradually switch to metal core and also to pyroprocessing for fuel recycling. As you can see, China’s ambition in both Generation III and Generation IV reactors is substantial (as is India’s). Let’s hope, for the sake of a stable climate system and long-term environmental sustainability of the human enterprise, that the economic rise of these two 21st century superpowers is fueled by advanced nuclear (uranium- and thorium-based) and renewable energy (where competitive), and NOT built on the same fossil-fueled 19th century technology that underpinned the development of the West. Frankly, either this works out, with China and India as clean energy leaders, or our goose is cooked. CO2scorecard.org says that China generated 66 TWh in 2009 from nuclear in 2009, which is 1.93% of national supply. That probably means it will take some time for nuclear to grow to a larger share of supply even with the Chinese aggressive deployment policies, which are leading worldwide. The fact that capacity of 400 GW in 2050 would still be only about a 20% share in generation shows how big the Chinese energy market is. Just out of interest, according to Adi Paterson at the thorium symposium, China’s target date for a commercial MSR is 2030. An energy crunch surely comes earlier than 2050. What capability is there to pull this huge build in while we still have the fossil fuels to manage the transition? Because, as uvdiv observed on The Capacity Factor, the real winner in China is coal. We need to stop congratulating ourselves and realize – we’re in a disaster, and nuclear power is failing us. Clearly the modest increases in nuclear power being proposed by most authorities won’t have any real impact on CO2 emissions, or alleviate peak oil or peak natgas. What is needed is the rapid education of a large workforce capable of deploying nuclear power across the world on a scale which dwarfs anything to date; thousands of gigawatt-scale plants, even tens of thousands of them. Decision makers in the major powers must recognise the need in order to launch this great program. Unfortunately most of them are presently looking in the wrong direction. 1) why are their coal imports increasing? 2) is it likely 2.5 bn people can achieve Western energy consumption? In the West our continuous average energy consumption is around 5 kw per capita. This comes from both Mackay’s 125 kwh per day for the Brits and ABARE’s 3915 PJ a year for 22m Aussies. However 2.5 bn X 5 kw = 12.5 Tw just for an affluent China and India. Current world instantaneous power consumption is variously cited as 15 or 17 Tw. We’d need two Earths for both Chindia and the affluent West to all live well in terms of current aspirations even if CO2 weren’t a problem. John, with current plans, you are right that no nation is going to do enough to avoid serious problems. My hunch is, though, that there is plenty of headroom available. We’ve just got to first make sure we’ve chose the right hats. I’ve got a new paper coming out soon in the journal Energy Policy that looks at the plausibility of a more ambitious scenario — I’ll blog about it once it’s published online. Barry I thought the BN reactors used liquid lead as the liquid metal instead of sodium. When did they switch? BN reactors always used sodium. Lead was used as a coolant on the Russian Alfa Class submarines. Do you know how the BN reactors are handling the sodium – steam interface? Are they using a double sodium loop like the IFR? What is different with the BN design than the IFR design? Brief but some information (yes a double sodium loop). First, thanks for this fascinating overview of China’s massive nuclear build out with it’s focus on fast reactors. Folks, the issue here is that the next 8 years are the critical period for ALL of what is written in this essay. It is during this period that the massive number of Gen II, III and a limited number of Gen IV reactors will come on line, essentially quadrupling their nuclear generation. Why is this important? It is from the component infrastructure and, human resources that is being built up during this period in these new plants that will lay the foundation for the projections indicated in the graphs above. It is during this period that will test…and stress…China’s regulatory nuclear agencies and regime. The Chinese will double and triple “shift” these new nuclear plant (historically Chinese power plants are way “over staffed” anyway, no reason to think this any different). This shakeout period will show the flaws and strengths of Chinese nuclear. But by 2020, with about 80 GWs online and their component factories humming away (and numerous overseas contractors as well) the actual *basis* for the all around expansion of their reactor paradigm will better be seen. I would also argue that there are competing technologies here. Part of this period, 2012 – 2020 will show us the true costs for building fast reactors and the reprocessing facilities meant to service them. You will see further development in Gen III reactors as well…don’t write them off. You will see an expansion of the above mentioned HTR pebble bed reactors and, of course the Chinese style LFTR. 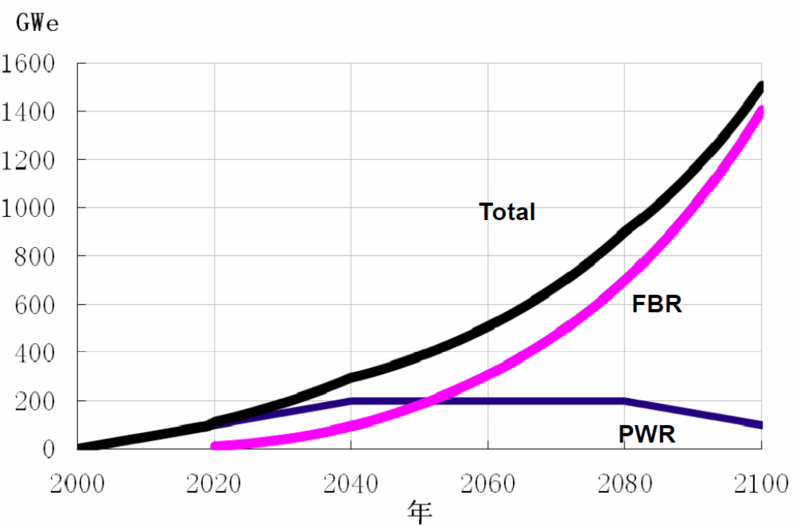 I’ve seen other predictions out of China saying that they’re shooting for 1000 GW of nuclear by 2050. Can they do it? Sure, especially if they start mass-producing IFRs along with their III+ designs. IFRs avoid production bottlenecks because they don’t need pressure vessels and have fewer pumps, valves, etc. But we all have to do it, not just China. The BN-600, by the way, has used oxide fuel and has been very reliable, but the Russians are now retrofitting it to use metal fuel, which is the direction they intend to go in the future. Tom, how is the reaction rate controlled with the metal fuel? Gene, can you clarify what you are asking re: reaction rate? I’ll ask it another way: how is generation changed? To go from say, 80% to 100%…what’s the throttle mechanism? David: AFAIK control rods provide power regulation and thermal expansion of fuel provides negative feedback. Control rods are effective for this in fast reactors, as the issue of FP poisoning due to high cross-section isotopes like Xe-135 is relatively tiny compared to the thermal spectrum. There is also steam-generation throttling, because unlike coal etc., you can run IFRs at 100% with essential zero impact in terms of fuel use. Barry…are you throttling the steam flow out of the steam generator? Does this not increase pressure in the generator? David, I simply meant the mechanisms typically used for coal (http://asmedl.aip.org/ebooks/asme/asme_press/801942/801942_ch6) — for nuclear this might include wet-steam turbines designed with throttle steam flow control. But I’m not a heat engine operator/engineer, so the details are probably best left to be answered by someone like John Bennetts or Rod Adams. As far as I’m aware, the main ‘lever’ for reactivity levels remains the control rods. “The unit employs a three-circuit coolant arrangement; sodium coolant circulates in both the primary and secondary circuits. Water and steam flow in the third circuit.” — from the wikipedia article linked in Barry’s post. My experience with coal fired power stations suggests that throttling of the steam is only practical in the short term. There is always a thermal balance to consider. Boiler Heat => steam => turbine shaft horsepower => generator electrical generation. Minor increases in steam production above steam demand can be and are managed by throttling the steam at either or both of the boiler outlet or the turbine inlet, usually the latter. However, if the excess of steam builds pressure above a predetermined limit, the safety valves will lift and dump steam to the atmosphere. This isn’t only very noisy, it also results in increased boiler feed water demand and of coal. The waste heat may not be too much of a worry with a nuclear plant. Perhaps most difficult to manage is the loss of demineralised water. This stuff takes time to manufacture on site. It is essential that demin water lost is made up immediately from storage. In a subcritical boiler (the old type, typical of almost every coal fired power plant in Australia), the lost steam results in water levels dropping in the boiler drum, the purpose of which is to hold a short term balancing supply of water at boiler pressure and feed it into the boiler via many inlets. The drum is like a big, fat manifold which sits right at the top of the boiler. If the water level in the drum becomes too low, emergency makeup is attempted via various sources. If that fails, we end up with a Boiler Trip. Boiler trips involve immediate shutting off of fuel, because otherwise the furnace walls could overheat and fail catastrophically. Once initiated, the trip cannot be re-set until the drum water levels are within range, then if we are lucky, a hot restart could commence. This process could take about half an hour, provided that the turbine and steam mains are still at working temperature. If stable drum conditions aren’t able to be achieved quickly, cooling of steam mains and turbine and main shaft will result a need to manage expansion, shaft hogging and metal stresses carefully via warm start or cold start procedures. Supercritical boilers do not have a drum because water under supercritical conditions of high temp and pressure behaves as a compressible fluid, more like a gas than a liquid. However, steam balance and safe working pressure limits result in similar boiler trip via the safety valves. When pressure reaches the max safe operating pressure of the boiler, the fuel is cut off and the safety valves lift, resulting in loss of demin water and need for restart. Operators can prevent the safety valves from tripping the boilers by dumping steam and water purposefully, eg via the Blowdown System, which acts to send steam or water to a tank for partial condensing and thence to a drain leading to atmosphere in a safe place. This is quite normal. This system is used for many purposes, eg to dump boiler water if the chemical limits are straying out of range, thus making space for introduction of fresh demineralised water. Note, however, that the blowdown system may delay the need for a boiler trip but cannot prevent loss of boiler feed water. From a heat transfer point of view, the blowdown system is not as efficient at dumping surplus heat as are the safety valves, essentially because the safeties bleed steam at the highest available temperature and pressure, ie the highest heat load per unit mass of water. For this reason, some boilers have elegant steam bleed arrangements which vary from design to design. Back to nuclear power plant. I assume that short term throttling of the flow of steam to the turbine is acceptable and normal, however if the turbine was backed off from say 100% to say 80% for more than a few minutes the energy input must be reduced by either slowing the rate of the reaction or by dumping excess heat. I can only guess how this can be achieved, perhaps via additional condenser capacity and a turbine bypass steam loop. Condensers in subcritical steam cycles dispose of at least 30% of the heat of combustion of the parent coal. Similarly and probably more so for subcritical NPP’s, because the temperatures and pressures are generally much lower than for coal fired boilers. I imagine that a larger condenser would be able to condense surplus steam and transfer the heat to the cooling pond or cooling towers or air (if air cooled), so even much more than 20% energy surplus could be managed over the necessary hours or days provided that the controls and condenser are appropriately sized and designed. There are operational and unit control issues involved, but they are manageable. I won’t go into them here – suffice to say that, like everything in life, the details have to be worked through. Given that supercritical boilers are unlikely in most (any?) NPP, my comments re supercritical boilers can safely be set to one side. My reading suggests that control rods, shields and other NPP control devices operate relatively slowly, over a period of minutes, hours and days rather than seconds and minutes. If this is so, the preference for operating NPP’s at steady load is clearly understandable. How do the French manage their load following? I suspect that they use large capacity condensers and steam-bypass lines from the inlet of the turbine directly to the condenser box. It is common for condensers to be configured to enable in service inspection and repair. For example, the condenser may consist of four separate sections, any one of which can be taken out of service while the others are still working. In a coal fired system, these could be 4 x 25% = 100%, in which case the unit’s capacity would be reduced by 25% when one pass is out of service. If, however, the condenser is designed as 4 x 33%, all passes would normally be in service, thus ensuring very good condenser performance. One pass could be removed from service and the unit would still be available at full load. This type of arrangement, whenever all passes are available, would enable immediate load following by dumping one third of the steam to the condenser. The unit could be steered down from 100% load to 67% load in a matter of minutes, at a cost only of the lost thermal energy, ie no real cost. Again, it is my guess that nuclear PP’s must have this kind of condenser, because otherwise, how could the condenser be maintained during the power station’s 30 or 40 or even 80 year life? Retubing condensers is a once-a-decade type operation, not once-a-lifetime. Coal fired systems can make do via scheduling short term low loads, eg at weekends. Nuclear power stations have no such maintenance window, so oversized condensers appear to me to be essential. Readers will by now have realised that I have convinced myself that load following for NPP’s which use steam turbines is ultimately a function of condenser limits and that most designs probably have substantial load-following capacity built in. This load following comes at the cost of heat energy and this energy is already a committed cost in terms of $$ per annum for the fuel load. NPP’s which use other fluids than water/steam or Rankine cycle conversion of steam energy to shaft power are another thing entirely. The above only applies to units which convert steam energy into shaft power via turbines, ie very nearly every existing commercial NPP. Re-reading, I realise that the 4 x 33% condenser passes would not enable load following down to 67% from 100%. This is because the steam would still be at boiler temp and pressure, not at turbine exit condition. It would still have 100% energy per kg of steam, not the notional 30%. The short term load-following capacity of a 4×33% condenser would be closer to 10% with no need for control rod insertion. Over a longer time frame, the control rods could slow the reaction and enable further load reduction. Note: This does not require batteries or additional capital expenditure, apart from the loop piping and valves to the condenser. It is cheap. Proposals to use batteries to achieve the same result would have to compare favourabley the marginal cost of waste heat from the NPP’s reaction, which previous posts have suggested is a fraction of a cent per kWh. The more I think about it, the more I am convinced that load following for most NPP’s is easy, safe, reliable and cheap. Thanks JB for that fascinating and highly detailed explanation on steam throttling – terrific stuff. I understand the steam throttle discussion. I was interested in learning more about controlling the steady state nuclear energy reaction rate and heat production. We all seem to lack knowledge in how the fast reactors control their heat production rates (other than the rate of energy extracted, which we understand). We know how the reaction rate of LWR is controlled by rods. However I am not sure the reaction rate of fast neutrons is controlled in the same manner. How to shut down and control the liquid metal nuclear reaction rate is still a mystery to me. That was the original question I was seeking an answer to. Gene, fast reactors are mediated by control rods in day to day operations, just like LWRs. A simple question: how China is going to produce enough plutonium to feed these FBR? In France projections from CEA shows that there is not enough plutonium in the following years to launch an independant FBR program even if France has one of the most important plutonium stockpile. So Gen III reactors will feed the FBR reactors for some time. What about China strategy? BN-800 with high enriched plutonium inputs looks like intersting when it comes to produce plutonium. Rouget, one does not enrich plutonium, one simply uses it as fissile in fast reactors (it is predominantly Pu-239). China is currently running 11 GWe of water-moderated reactors (with 25 GWe more under construction). This produces ~250 kg of actinides per GWyr, so by 2018, even starting today and not accounting for any new builds coming online, they will have produced an additional 20 tonnes of fissile for incorporation in FR fuels in the next 7 years. This will be suitable for starting up ~2 GWe of their fast reactor demonstration plants. At this stage, available fissile is not an issue. I made a mistake and wanted to wrote “with high enriched uranium inputs”. Thanks for the information. They have enough plutonium to start the first step but what next if they want to start a FBR program on a large scale? John, I echo Barry’s thanks about this. I’ve worked gas fired thermal units and GTs but not coal. The steam turbine operation is the exact same, it appears. I’m assuming there is a fuel flow/steam flow relay that adjusts firing when load goes down (or up). Lifting of relief valves in anything but non-emergency situations is considered “Verboten” as you know…every-time one lifts a scheduled re-calibration of the pressures at which they lift needs to be organized. A real pain. LWR in France use ‘gray rods’…kind of like dummy fuel rods that allow for a much slower increase in Xe and other poisons. There is a good description of this on the WNA country briefings from France. Additionally it is a “fleet organized” as not all reactors after a certain period are used for load following, only designated ones. One if the criticisms of the Fast Reactor models of the 1960s was exactly the issue of controlling the reaction. I’ve never seen it actually spelled out but I understand it was an “issue” with the Gen 1 reactors. Not sure this is a problem with the Russians. Bore injection in the primary circuit. 70% power variation in 20 minutes. French nuclear works in baseload and semi-baseload. Before introducing this method, engineers have tested a series of other solutions : hydrogen production through electrolysis feeding homes with “town gas” (H2+CO) and hot pressured water vapor trapped in underground granite cavern insulated with perlite. Regarding the limitations of fissile for starting up a large IFR program, this is something that relates not just to China but anywhere where such a ramped-up IFR deployment is contemplated. Since IFR fuel needs about 20% fissile to run, vs. about 4-5% for LWRs, it’s often been said that simply enriching uranium to 20% wouldn’t be economically feasible. Otherwise, there’s no reason why one couldn’t just use normal enrichment processes and do so. There are a couple angles on that argument that I don’t think makes virgin enrichment a deal-breaker once available fissile runs out and before enough new fuel is bred in the new IFRs. For one thing, fuel cost for LWRs is really only a minor cost, and it keeps being done for the life of the reactor. If you had to pay 4-5X the cost for your initial fuel load, that shouldn’t be prohibitive because you only have to do it one time, not every year or two. Another point: Laser enrichment looks like it’s very close to becoming a reality, with GLE having already applied to the US NRC for permits to build their first commercial laser enrichment facility. This would use the SILEX technology that promises to bring the enrichment cost down to about $50/SWU (Separative Work Unit, the metric for enrichment), whereas the best centrifuge systems are said to be planning for about $100-125/SWU. A different type of laser enrichment that hopefully will soon be demonstrated would probably cut that again, to about $25/SWU. If we can do that, then the startup fuel for IFRs would be about the same as that of LWRs—but again, you’d only have to buy it once. After that you just carry in more depleted uranium from time to time. Either way, don’t let the shortage of fissile material discourage you from contemplating a massive rollout of IFRs. It is entirely doable. Further to Rouget’s question and Tom Blees reply regarding the enriched-U route. We can do a few further calculations on the actinides supply. Assume the following (and let’s do some really simple back-of-the-envelope calculations). China has run 11 GWe for 20 years. In 2015 it will have 30 GW, and 80 GW in 2020. In 2030 it will have 200 GW of LWRs. Assume 250 kg of fissile actinides per GWyr, and a FR loading of 12 tonnes/GW (to be conservative). Assume also the stated FR breeding rate of 1.5 (see the Xu Mi talk), for a doubling time of 15 years (we can do better). By 2030, the LWRs will have yielded ~540 tonnes of actinides in China (based on some simple linear calculations). This could provide loadings for 45 GWe of fast reactors by 2030, even assuming no breeding. With 45 GWe breeding with a doubling time of 15 years, we could start an additional ~3 GW from bred actinides and 4 GW from LWR spent fuel each year thereafter, and indeed more each year as the new IFRs themselves breed and probably more LWRs are built. 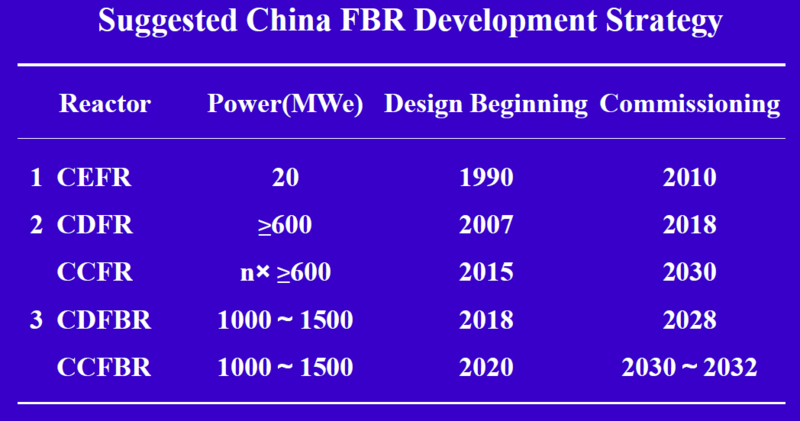 So by 2040, following the same calculation and assuming a final cap of 300 GW of LWRs (being conservative again), we could still have 300 GW of LWRs and 155 GW of FRs in China. By 2050 it would be 300+380=680 GW of nuclear. And so on. This basically agrees with Xu’s projections in the slides, and they could go faster if they built more than 300 LWRs over that period and/or ramped up their thorium programme, and/or used enriched-U, too. I think the Chinese will follow in Japans footsteps and create a huge and efficient manufacturing economy based primarily on Nuclear power. The Chinese seem to be a lot smarter than us in the West. Perhaps that is because there are not a lot of political discussions involved. Another point: Laser enrichment looks like it’s very close to becoming a reality, with GLE having already applied to the US NRC for permits to build their first commercial laser enrichment facility. This appears to be a very controversial technology (here and here). And the fact we are keeping the technology a secret gives me little confidence. For some perspective on the uranium gap for China, this article (Yang, et al, 2009) takes a close look at Chinese production goals, and the challenge of meeting projections with overseas supplies, reprocessing technologies, accelerated exploration, PWR/CANDU synergism, and thorium-based fuel cycles. It’s a pretty significant concern, and at current 1% energy mix from nuclear China has never been able to meet its fuel demand with domestic supplies. I suppose this is probably a good thing as concerns global cooperation, and leverage over China to keep global interests in mind and moderate it’s relationship with rogue states. We already have a global uranium production shortfall of 1/3 demand (currently met with secondary supplies). I’m having a bit of a challenge trying to make sense of the Chinese approach (other than seeing it as a cultural pride and whose first race with South Korea). Has anybody been able to break the 20% energy production threshold with nuclear using an everything under the sun and all possible reactor designs approach? Another article (Sovacool, et. al, 2010) looks at scaling nuclear for the future and lessons learned from France, and concludes China may be creating more problems for itself in the long run than it appears to be solving. Among their primary concerns: “closed political systems that minimize opposition, debate, and discussion and foster low transparency and accountability” (p. 3811). China is clearly one of the last labs left willing to make any expenditures of this scale on big new command and control energy projects (with well regulated and well functioning free markets as a secondary concern). I’m not sure if I should be frightened by this kind of approach or recommending it as the last great hope of a techno-political global energy regime (leaving untouched rapidly rising global consumption and resource utilization rates). EL — YOu might check up on the latest plans in India. EL writes of laser enrichment: …And the fact we are keeping the technology a secret gives me little confidence. I don’t know why the link you have there goes to the page on Pakistan’s rogue scientist Khan, since he has nothing to do with it. As for deciding to keep it secret, there are two motivations for GLE to do so. The first is that it’s a sensitive technology and so the government wants them to keep it secret. The other is that GLE would be able to virtually corner the global market on uranium fuel enrichment because of the low cost of laser enrichment, which would be priceless. Wouldn’t you keep it a secret too? As for China, what does it matter if they don’t have domestic uranium production? Uranium is a global commodity, and if anybody is in a position to buy what they need it’s China. Lots of new uranium mines will be starting production in the near future, so it looks like an unwarranted fear to be talking about uranium shortages at this point (and of course with breeders it won’t be an issue at all). Has anybody been able to break the 20% energy production threshold with nuclear using an everything under the sun and all possible reactor designs approach? I don’t really see what your point is here. Several countries have blown away what you call “the 20% energy production threshold”, with nuclear supplying far more than that in sixteen countries around the world. While I would suspect those countries might not use an “all possible reactor designs approach”, the fact that China is exploring several different designs isn’t seeming to slow them down. They’re building some and doing R&D on others. Maybe if more countries had their government made up primarily of engineers (as China does) instead of lawyers (like in the USA) things could get off the dime a lot easier. To think China can’t walk and chew gum at the same time is belied by their development. I just received the latest issue of GreenMail (Spring 2011) published by the NSW branch of The Greens and on the front page the pointer: The Nuclear Debate: Worth Reopening? The articel, by Peter Fry, who is, inter alia, the NSW Greens Assistant Policy Coordinator, touts the virtues of the Thorium Molten Salt Reactor and opens with the research being done in China. From an environmental perspective, new reactor designs being developed by the mainstream western nuclear industry are offering little if any impovement in terms of environmental or human safety. However, the type now being explored by the Chinese could both offer real improvement and als threaten the whole modus operandi and business model of the present day nuclear industry. The question is, if these reactors are so wonderful why don’t we have them today? The popular answers seem to be — War and Profit. Warfare was a major factor as they types of reactor in use today were initially favoured in the 1960s because the great amount of high level waste they produced was a valuable source of raw material for subsequent processing into nuclesar weapons. Profit remains a factor because the nuclear power business model was and still is based on the supply of layers of complex safety systems and fuel processing arrangements required to deal with the danger and inefficiency of the design of reactors we have. One need not comment in great detail on the underlying reasoning here. These matters have been canvassed at great length here before and recently, and I have some reservations about them. What is interesting is that nuclear power is being given sympathetic treatment in an official publication of the Greens by a senior member. We here ought also to note very carefully the way in which Fry goes about pitching the case at a party of people who are overwhelmingly hostile to consideration of nuclear reactors. In many respects, Fry retraces the path I travelled along to arrive at support for nuclear power. The idea of thorium forces a reconsideration of the underlying issues that is not tribal or a fact of cultural history in the way uranium has been. It is not bound up with Chernobyl of Pershings or even Fukushima. Once a rational appraisal starts, we have the beginnings of a shift in policy. They’ll come for the proliferation resistant thorium MSRs. They’ll stay for the AP1000s rolling off the assembly lines and building out an emission free generation system. I think it would be wonderful if the Greens were to take on the issue and then take the lead on championing the environmental imperative for nuclear power. Thanks for passing that on Fran, and good luck. This November 17 article at World Nuclear News says that China plans to build two small reactors for $787 million, under the “ACP 100 modular design”, a 100 to 150 megawatt pressurized water reactor. I think it is an excellent idea to build smaller units. You can always have ten of them at the same site if you want more capacity. This is exactly what the nuclear industry needs. Smaller units, and more of them. Economies of scale don’t work any more. They might lead to slightly smaller costs per kilowatt, but at the cost of much higher minimum investment sums, longer construction schedules, more delays in permits, more popular opposition and higher risks for investors from the sum of all that. I will note here that while this issue of large vs small reactors is definitely the topic for another thread, people should not *assume* that smaller reactors are somehow more economical than large reactors. That 10 x 100MW reactors will be cheaper than 1 x 1000MW. This is completely unproven. The advantages of the SMR is for the market niche they fill, not the necessarily the answer to all the future LFTR/IFR builds in the future. What makes SMRs ‘cheap’ IS the same that will show AP1000 to be cheap over the next 10 or so units built: modularity. I sometimes get the feeling that we think making SMRs is like making vacuum cleaners or toasters. They are more like making air planes. I urge people to go the GE web site and look at their adverts for the jet engines. Factory built? Yes. And everyone of them *hand-assembled using mallets* and lots and lots of hand assembly. This is exactly how SMRs will be built. A bit more on throttling / load following / reactor control……..
Load is reduced, so controls reduce steam flow to the turbine. Less steam is removed from the boiler, so average boiler temperature rises. There is less thermal gradient over the secondary loop-to-steam heat exchanger, so the secondary sodium (or molten salt) looses less heat and returns to the reactor hotter. Hotter secondary fluid removes less heat from the primary loop. Hotter primary return increases average core temperature. Any increase in core temperature reduces reactivity, so the core goes from steady-state critical K = 1.00000……. to K = 0.9999 (say). K<1 means that the fission power begins to fall exponentially, with the rate of fall determined by how low K gets. Temperatures continue to rise, and K to fall, until the reduced fission power again balances the reduced load. Temperatures are still above normal, and K1, and power increases again until it matches load, then exceeds it and pushes temperatures back up. Part of the job of reactor engineers is to ensure that this sequence does not continue in wild power oscillations, but instead settles down with successive over/undershoots getting smaller. If the power change at the turbine is slow enough, core power just smoothly tracks the load without oscillating at all. For LFTR, ‘slow enough’ is quite fast, as even an instantaneous 50% load drop only causes one full down-up-down ‘bounce’ in power, and just up-down in temperature. Since IFRs can also stand unprotected loss of load, I expect the response is similar, though others here will know far better. At ordinary load following ramp rates of ~10% per minute, the core just follows with trivial temperature change. Luke that’s my understanding of LFTR operations as well. Control rods are not used and generation is determined by…load. That is, for second-by-second load following, load on the grid drops (or increases); causes system speed rely to see lowering of load, governor valves on turbine close (this would be true for Rankine as well as Brayton cycle turbines); steam/gas flow pressure surges slightly at supply side of valves, heat increases *backward* through the heat exchange loops, rate of criticality drops in slightly hotter reactor. It is actually a far more efficient form of load control for the reactor than in a convention boiler which requires all sorts of Rube Goldberg like ‘feed forward’ relays for the same process using potential transformers and steam-temp/pressure-to-fuel-air ratio mixtures. Writers on LFTR think that load controlling will be, for Brayton cycle closed GTs, *almost* as fast as hydro. The idea, always, for IFR or LFTR that the main bottleneck for load changes be the turbine: either for turbine temp limits or gas/steam flow limits, not the reactor. I doubt the IFR would be throttled in the way Luke_UK describes. Operators would want to avoid temperatures of the fuel rising beyond about 550C, because after this, the inner wall of the cladding starts to form a eutectic with the metal fuel. From an accident safety perspective this is no issue — the IFR is self-protecting via neutron leakage from the metal fuel and convention of the sodium — but heat-feedback reactivity regulation, without use of control rods, would not I think be something done in day-to-day operation. The temperature swings aren’t that big. Even for the 50% step change case, it’s only ~30C. For gentle changes from normal load following, only 1-3C. Gen IV cores are wonderfully responsive, a bonus from designing in rapid passive shutdown for safety reasons. Thanks Luke_UK, it might be okay then. IFRs are typically run at 510C outlet temperature (the EBR-II) to give plenty of margin, so it may well work out. I should ask Yoon. Clearly Areva has been working hard on solving problems created by France’s nearly complete reliance on nuclear plants. It would also be feasible to use excess power at times of low demand to charge pumped storage reservoirs and recover this energy during peak demand periods. A closed Brayton cycle follows load differently than an open Brayton cycle. In closed cycle the power is varied by changing the mass flow as opposed to open Brayton, where (in most cases) power is changed by increasing or decreasing turbine inlet temperature. This gives closed Brayton an advantage in that part load cycle efficiency is better as you can hold T4 constant as you go to part load. As you all know high T4 is a good thing from a cycle efficiency point of view. Thx for this load following discussion. Am I correct in stating that a sodium cooled fast reactor is better at following load than BWR?? Anyways I’ve been quiet lately but one thing is bugging me: Liquid metal reactors wherein the fuel mix also comprises the primary heat transfer loop. I understand the advantages of better thermal tranfer, lack of high-pressure components in the reactor itself, etc. I also understand the reaction only takes place in areas with a sufficient diameter. But I wonder how they would best manage reliability and power scaling. I understand the system has plugs which will passively melt and drain the fuel in event of a cooling failure, but how easy and how safe would it be to service the system? For example, could they evacuate ONE loop, scrub and service, reactivate while the system continues to operate? Or would a whole unit need to be shut down and overhauled? When your fuel is a liquid metal and reactions take place in areas of sufficient diameter, how many DIFFERENT forms of moderation are possible? Would rods be inserted into empty tubes that pass through the reactor body? Or would they be housed completely inside the liquid to prevent voids? (Certainly it wouldn’t make sense to dip the rod through a hole and into liquid metal which would contaminate the rod when removed) Can liquid metal be moderated by changes in temperature? Changes in vessel diameter, vessel length, flow rate? How much infrastructure would be needed for heating elements? How much power to you need to start the system, prime the pipes and coolant? This plays into my previous question about serviceability. If a new plant requires, say….an average of 1GW for two whole weeks to reach stable output, that’s fine if it delivers 5GW continuously for many years thereafter. But if a problem is discovered, it makes a big difference whether you lose half your output (or more) for anywhere from six months to three years. Or if you can lose 10% or less for the span of a few weeks. Things like service, disposal and lifetime average power factor are pretty damn important. I’m not concerning myself with claims in regard to fuel maintenance during operation, those honestly seem very simple from what I know about the materials and decay products. Relgorka, the fuel is not liquid metal, the coolant is. The fuel is composed of U-Pu-10Zr metal pins held in stainless steel cladding, arranged in a core that can be surrounded by a DU breeding blanket or a stainless steel reflector. The freeze plugs are part of the LFTR design, not sodium-cooled fast reactors. In the IFR, the pumps in the primary circuit will be electromagnetic with no moving parts. Well that was much simpler than expected. With so many technologies using different materials and similar acronyms, I’m surprised I can remember whether we’re talking fusion or fission…as some of the pieces I’ve read elsewhere can not manage to keep that much straight. “Gates has largely funded a Washington state-based company, TerraPower, that is developing a Generation IV nuclear reactor that can run on depleted uranium.